People interact and perform in group settings in all areas of life. Organizations and businesses are increasingly structuring work around groups and teams. Every day, we work in groups such as families, friendship groups, societies and sports teams, to make decisions and plans, solve problems, perform physical tasks, generate creative ideas, and more. 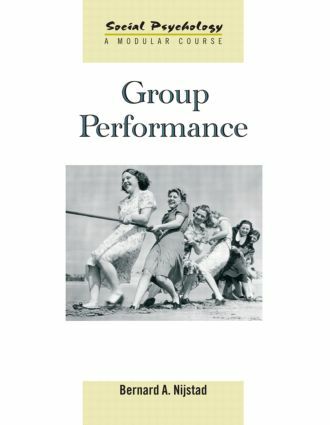 Group Performance outlines the current state of social psychological theories and findings concerning the performance of groups. It explores the basic theories surrounding group interaction and development and investigates how groups affect their members. Bernard A. Nijstad discusses these issues in relation to the many different tasks that groups may perform, including physical tasks, idea generation and brainstorming, decision-making, problem-solving, and making judgments and estimates. Finally, the book closes with an in-depth discussion of teamwork and the context in which groups interact and perform. Offering an integrated approach, with particular emphasis on the interplay between group members, the group task, interaction processes and context, this book provides a state-of-the-art overview of social psychological theory and research. It will be highly valuable to undergraduates, graduates and researchers in social psychology, organizational behavior and business.